In the neck (the cervical spine) there is an inward/concave curve (lordosis), of 20-40 degrees. In the thoracic spine there is an outward/convex curve (kyphosis or round back), of approximately 20-40 degrees. In the low back (the lumbar spine) there is another inward/concave curve (sway back) of approximately 30-50 degrees. Thus the normal spine naturally has curves. However, in some individuals these curves become more or less pronounced. When the curve becomes abnormally convex, particularly in the thoracic spine, the patient is described as having a hyperkyphosis. Postural curve – This type of curve is flexible, and is most likely to be the result of poor posture. A patient can consciously correct the curve. Structural curve – Patients cannot correct this type of curve. The curve will often display a sharp, angular pattern called a Gibbus, which becomes more prominent when the patient bends forwards and is viewed from the side. Secondary kyphosis – Hyperkyphosis is often the result of another problem in the spine (i.e. secondary), such as a fracture in one or more vertebral bodies, or when multiple discs have degenerated and their height has decreased. Primary kyphosis – A primary kyphosis does not result from another problem in the spine. The most common form of primary kyphosis is Scheuermann’s disease. The exact cause of Scheuermann’s is not known, although there does seem to be a pattern of occurrence in families. The disorder is usually first noted in adolescents in the 12-14 age range, although the condition may start earlier in life. The disorder affects females more than males. Most patients visit a doctor with this disorder when they become aware of a convex curve to their back. Some patients may also see a doctor due to back pain, especially those adolescents who have a thoracolumbar kyphosis. In addition to the convex curve in the thoracic spine, some patients develop what is called a compensatory curve in the lumbar spine. Your doctor will employ several diagnostic methods to accurately diagnose your condition. A physical exam will help to visually identify a curve. 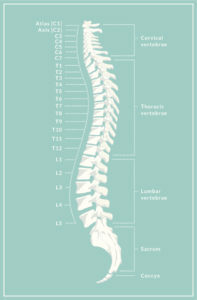 A forward bending test will be used to determine if a thoracolumbar curve exists. In addition, the doctor will look for tightness of the hamstrings and tenderness with some of the spinal muscles, both of which are common symptoms of Scheuermann’s kyphosis. At least two specific x-rays will be done. The first is a standing, lateral (sideways) x-ray, and the second is standing x-ray from the front. These are used to identify the curves in the sagittal plane (side view), and to determine if a curve exists in the frontal plane as well. In addition to x-rays, your doctor is likely to order an MRI to provide further imaging detail of the spine. Particular attention will also be given to the radius of your curve. If the radius is relatively large, it indicates that the curve is smooth. A smaller radius indicates that the curve is sharp and angular. Curves that are more angular are more likely to progress. If thoracic kyphosis in an adolescent exceeds 70 degrees it is a clearly visible deformity. Treatment is usually recommended to prevent further progression of the curve. The primary non-operative treatment of Scheuermann’s kyphosis is to use a brace to prevent further curve progression. The brace will be carefully fitted by a specialist to ensure maximum comfort, and can be worn under clothes. In addition, your doctor is likely to prescribe a carefully designed exercise and physical therapy program to help spinal flexibility and increased muscle strength. The surgical procedure will obviously be tailored to fit your specific condition. Your surgeon may do the procedure from the front of the spine, from the back of the spine, or may do a combined procedure that involves approaches from both the front and back. A fusion of several vertebrae supported by instrumentation (including hooks, screws and rods) will probably be used to correct the spine’s alignment and to prevent further curve progression. A surgical procedure to correct Scheuermann’s kyphosis is a major procedure, requiring a gradual and careful recovery period. Prior to surgery your medical team will explain what to expect in the recovery process. After surgery they will instruct and encourage you through each stage, from leaving the hospital, to beginning light exercise to returning to school or work.